I’m 64 years old and just received my Triple Crown of Hiking award. This award is not held by many people. It is a club of 230 members, world wide. I retired from full time work at age 52. From 2007 to 2013, I successfully thru-hiked ( mean continuous walking) all three of the National Scenic Trails: The Appalachian Trail (2007), the Pacific Crest Trail ( 2010), and the Continental Divide Trail ( 2013). My total achievement was close to 8,000 miles, not including other hikes I have taken part of in that time period. 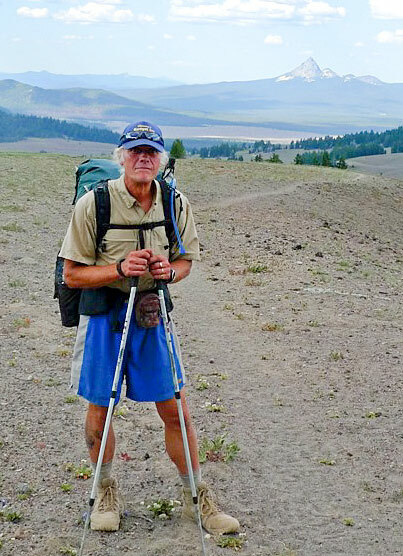 Aging hikers should hear that there is no need to think of ourselves as incompetent, or diminished by our age. I find that a broad bank of experience and an ability to embrace improvisation are qualities that we gain with age. What we may lose to strength and flexibility is minor, compared to what we can gain by placing one step in front of the other. It is worth it to keep active. I was not sick even once during the 450 days it took me to walk these amazing trails. Walking is free, and there’s generally no place to spend our limited retirement money while on the mountains, in the deserts, over the prairies, along the way. I have proven it is possible for individuals that are in their 60’s to walk 20 miles or more a day, every day, for a half a year at a time. Since completing the Appalachian Trail in 2007, I have maintained a blog that is devoted to getting outside, be it walking around our neighborhoods, riding bicycles around the woods and back roads, snowshoeing in the forests, canoeing our scenic waterways, or motorcycling in remote locations. My blog is at www.tjamrog.wordpress.com. It has over 800 entries, including day by day journals from all three of my five month-long backpacking journeys. I am always willing to communicate with others who want to talk about walking-I'm on Twitter (@tjamrog), and welcome emails at thomasjamrog@me.com . I am also a public speaker, and have recently given two keynote addresses to outdoor organizations. One month ago I passed the requirements for my Maine Guide’s license. I am planning to start guiding aging adventurers in 2015 who still have some places to go on their Bucket Lists, be it backpacking trips on the Appalachian Trail, standing atop Mount Katahdin, or getting out in the middle of the winter to explore the wilderness on snowshoes and spend the night in a heated tent in places like Acadia National Park. I plan to lead trips of 3-7 days to start. Let me know if I can help you out in any way. I like you concept of fifty sense, although I’m now midway into my sixty sense years.